Published: Apr 24, 2017 · Modified: Apr 12, 2019 · By Jen Sobjack · This post may contain affiliate links. 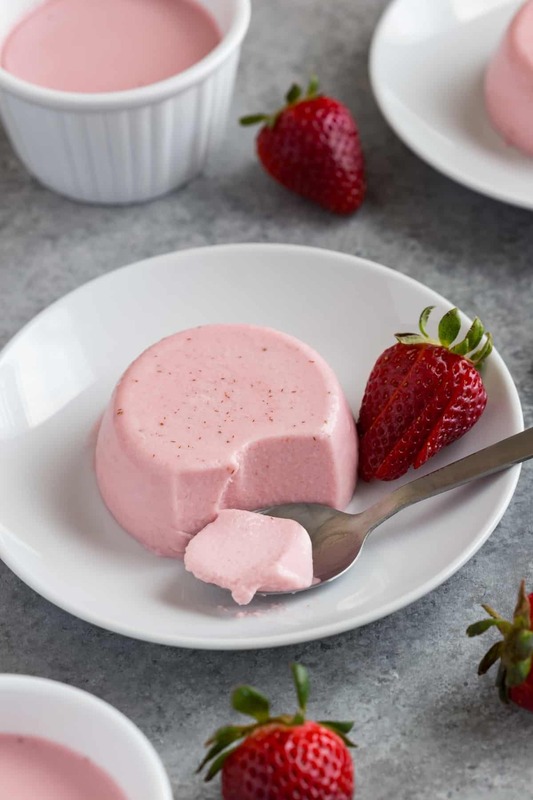 Strawberry Panna Cotta is a delicious, creamy, and delicate dessert. Great for a simple summer dessert or a fancy dinner party. It’s so easy to make with just a handful of ingredients. Panna Cotta is one of those sophisticated desserts that’s also simple enough to make for a weekend treat. It’s one of my favorite no-bake desserts to make. Sometimes I enjoy chocolate almond milk panna cotta or kiwi passion fruit panna cotta. The cool creamy texture hits the spot every time. I recently had the opportunity to travel the Caribbean on a cruise through the Panama Canal with Princess Cruises. We sailed aboard the Coral Princess and had the best time. It was truly an experience I’ll never forget. The food on the ship was phenomenal. There was an abundance of desserts to choose from. So. Many. Desserts. A dessert blogger’s dream. I tried a couple different desserts each day and fell in love with the strawberry panna cotta. The moment I laid eyes on it I knew I had to share it on Instagram. Most of you know I prefer fruity desserts over chocolate. Chocolate is good and I like it but if I have a choice I’m going for something fruity and creamy. For breakfast and lunch, we would go to the horizon court. They have a buffet style set up and the menu is different each day. I like to eat light and there was an abundance of fruit and vegetables to choose from. Also, inside the Horizon Court is a dessert bar. It reigned me in every time! I couldn’t walk away without trying one or two the cakes, cupcakes, tarts, etc. This is where I found the strawberry panna cotta. I’ve been home for a couple weeks now and I’ve had the biggest craving for this panna cotta. The only way to solve it was to make my own version. It’s creamy and full of fresh strawberry flavor. 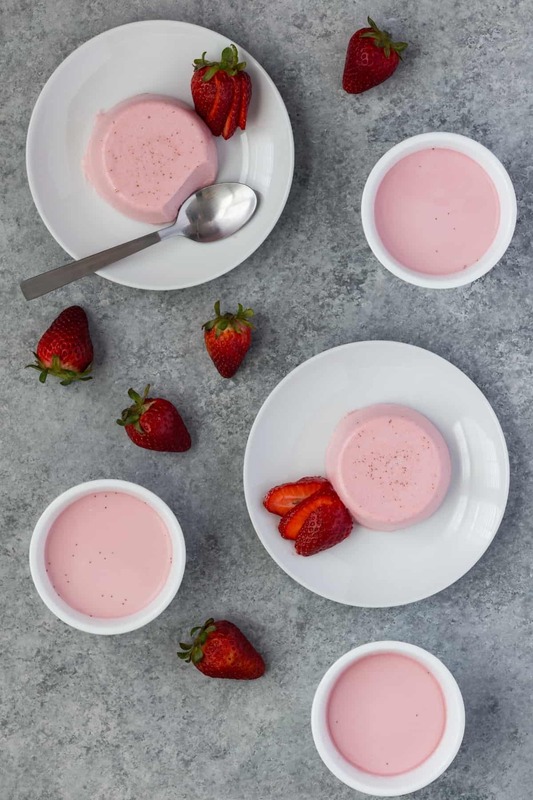 I took the basic panna cotta ingredients – milk, cream, sugar, vanilla, and gelatin – and added pureed strawberries. It came out light in color so I also added a couple drops of red food coloring. This is totally optional and only needed for presentation. 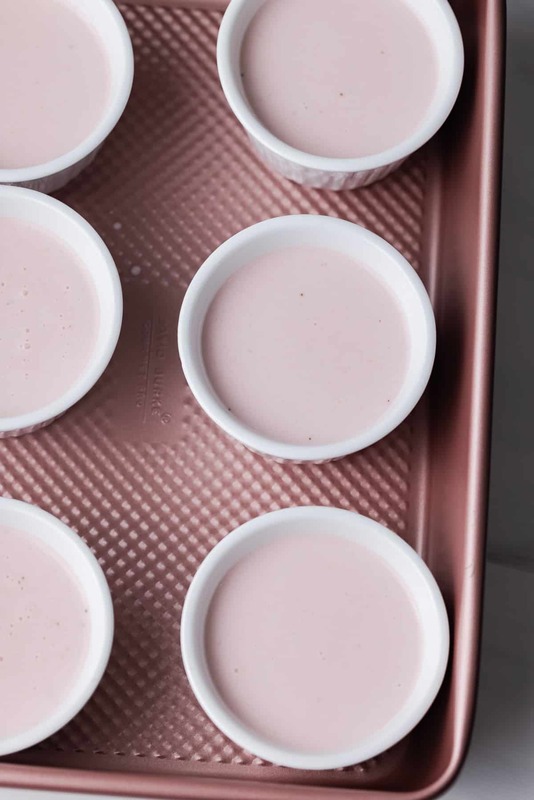 If you want to have a taste of what cruising with Princess Cruises is like, whip up a batch of strawberry panna cotta! 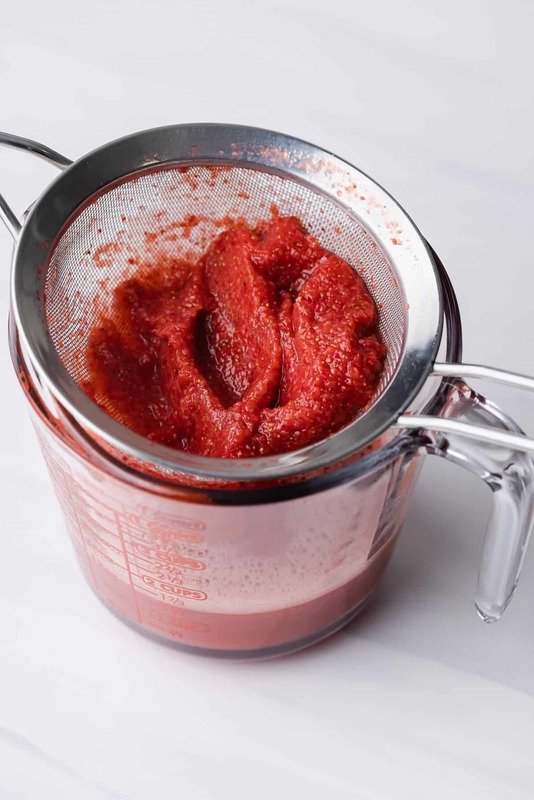 Puree strawberries and press through a fine-mesh sieve. Discard the seeds and pulp. 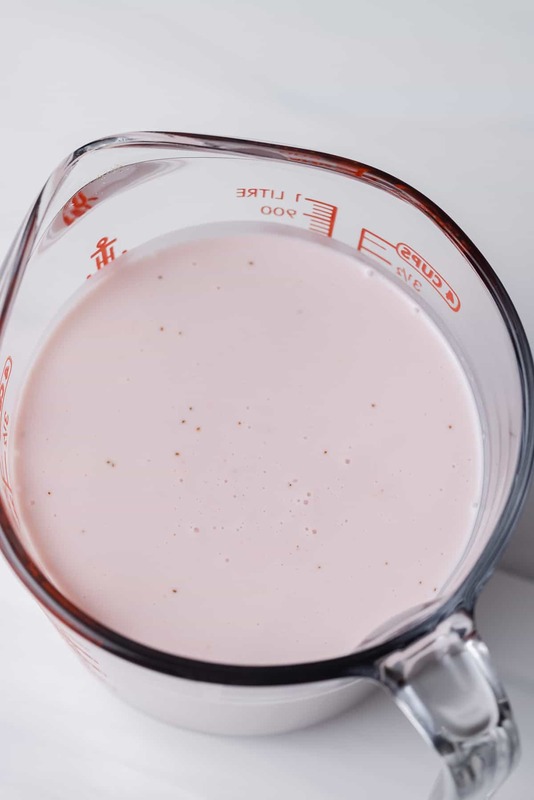 Sprinkle gelatin over milk in a medium saucepan. Let it sit for 1o minutes. 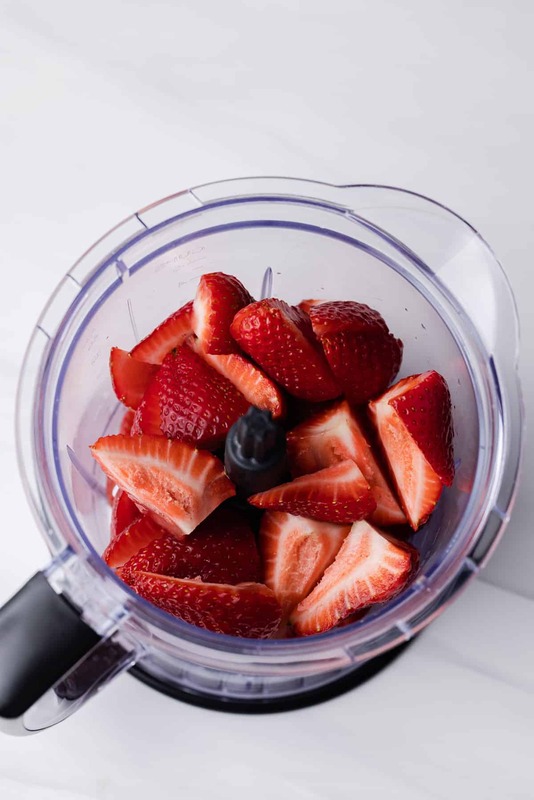 Add sugar, salt, and the pureed strawberries. Cook the mixture over high heat until it reaches 135°F. Stir in heavy cream and vanilla. Strain the panna cotta into a large bowl and set the bowl over an ice bath. Stir until it’s cooled to 50°F. Divide the panna cotta to ramekins and refrigerate until it’s set, about 4 hours. You should also try this Chocolate Pistachio Dome, these Profiteroles with Fresh Berries, these Chocolate Raspberry Cupcakes, these Banana Oatmeal Chocolate Chip Cookies from Dinners, Dishes and Desserts. And this Sheet Pan Pizza from Dash of Sanity. 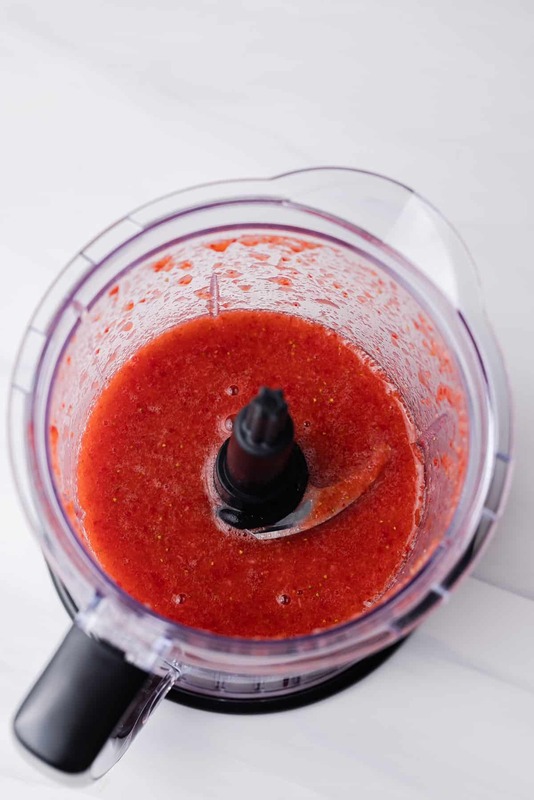 Puree the strawberries until very smooth. Push the puree through a fine mesh sieve to remove the seeds and set aside. Place 6 4-ounce ramekins on a baking sheet and set aside. Add the milk to a medium saucepan. Sprinkle the gelatin evenly over the surface and let stand for 10 minutes. 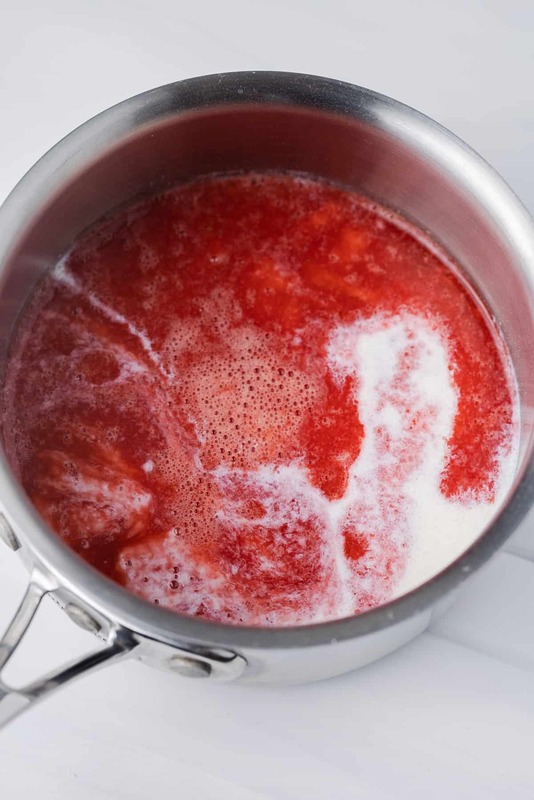 Add the salt, sugar, and pureed strawberries to the gelatin mixture. Heat over high heat, stirring constantly, until the mixture reaches 135°F. This should take about 2 minutes. While stirring constantly, add in the vanilla and heavy cream. Transfer the mixture to a medium bowl set over ice. Stir frequently until the mixture cools to 50°F, about 10 minutes. Strain the mixture into a large measuring cup or pitcher and distribute evenly among the ramekins. Cover the baking sheet with plastic wrap, making sure not to disturb the surface of the cream. Refrigerate for at least 4 hours. Unmold from ramekins and serve immediately. Panna cotta will keep for up to 3 days covered with plastic wrap and stored in the refrigerator. To easily unmold panna cotta – Pour 1 cup of boiling water into a small bowl. Dip the ramekin into the water for 3 seconds. Run a knife around the edges of the ramekin and invert onto serving plates. If you do not have a candy thermometer to gauge the temperature in step 3, simply cook until the mixture is steaming. This will take approximately 2 minutes. This was lovely! This was the first time I’ve had panna cotta much less made panna cotta, and I can see why it’s such a wonderful dessert! The recipe was very easy to make and delicious. The panna cotta was light, delicate, airy, fragrant, and the flavor was layered. Thank you! Do you know approximately how much puree that 1lb came out to? I have some frozen puree I would like to use but don’t want to over do it. Cheers! It’s about 1 and 1/4 cups. Can this panna cota be frozen? I don’t recommend freezing panna cotta. Can i use frozen strawberries? I mean thaw them to rest so it defrosts and use them? I haven’t tried making this with frozen strawberries but I imagine it would be okay as long as you thaw and drain them well before using. 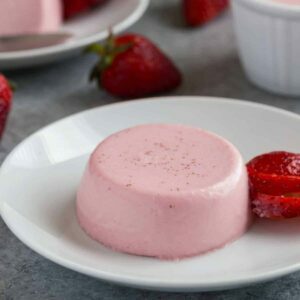 how long does this strawberry panna cotta last in the refrigerator? Or can it be frozen? Panna cotta should be good for up to three days in the refrigerator. Make sure to keep it covered tightly with plastic wrap. I don’t recommend freezing panna cotta. Can I easily cut the sweetener down in this recipe? Using less sweetener won’t affect the texture at all so it should be fine to use less if you need to. I made this using all whole milk instead of cream and it was still delicious. Used some of the strawberries to make an easy sauce, adding a little sugar. Beautiful, too. I’m happy to hear it came out wonderful! I love Panna cotta pls tell me which heavy cream it is….pls I want to know the particular name of the heavy cream. It’s just regular heavy whipping cream. I can’t remember the brand I used in particular because I usually buy whatever is on sale at my local market. What a beautiful job you did with this – it looks just like I remember on the cruise!! This strawberry panna cota is just beautiful! It reminds me of my red berry soufflés published today on my own blog. But for now, I’m all into your lovely dessert, I can’t wait to try it! I’ve never worked with powdered agar so unfortunately, I can’t advise you in this area. I’m sorry, I wish I could be more helpful. 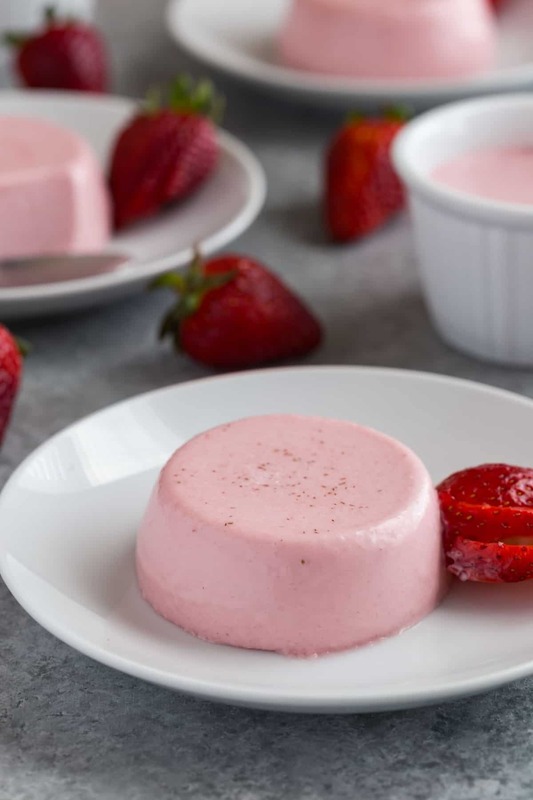 I love, love panna cotta, but I’ve never had a strawberry version before. I’ll have to give this a try.